Today I thought I’d share and apps that tries to keep my data usage in line. My current wireless plan only includes 500MB of data which means that if I’m not careful I can easily use more than that in a month. So having an app like My Data Manager is a must. The apps notification widget shows a quick overview of your current data uses, for Mobile and WiFi. You can configure it to include Roaming data, but as I don’t Roam I have removed it. When you launch the application you are provided with a summary of your current plans usage, forecast of how much data you’ll use this cycle, today’s usage, amount remaining for the day. The important number for me is the Data Remaining, It averages your data for the remainder of your cycle, giving you a target if you want to get back on track. 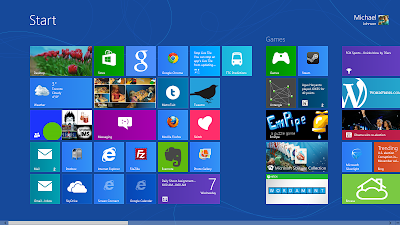 After the initial tab there are three more tabs chalked full of information about you data usage. The first is a summary of data usage by app, on either Mobile, Roaming or WiFi. The information can be summarized by Month, Day, hour and Plan. I like being able to see how much data each app is using. This helps me identify apps that I either have to stop using or disable unless I’m on WiFi. 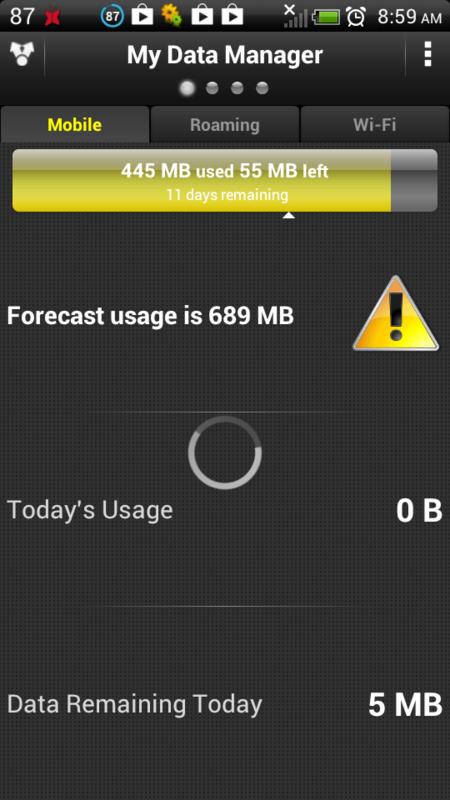 As you can see this month the app Friday has used a quarter of my months data, so it’s been regulated to WiFi only. The one feature that I wish My Data Manager had would be a way to prevent specific apps from using mobile data. Settings allows you to set up your Plans data limit and when. Plus set alarms to warn you when your data usage gets to certain points during the plan or day. Over all the app has a ton of flexibility and has proven to be very reliable for me over the last few months. The first graph is a bar graphs, showing your usage by Month, Day and Plan. Being able to compare data uses between Mobile, WiFi and Roaming in one quick view is interesting, but I’m not really sure why I need it. 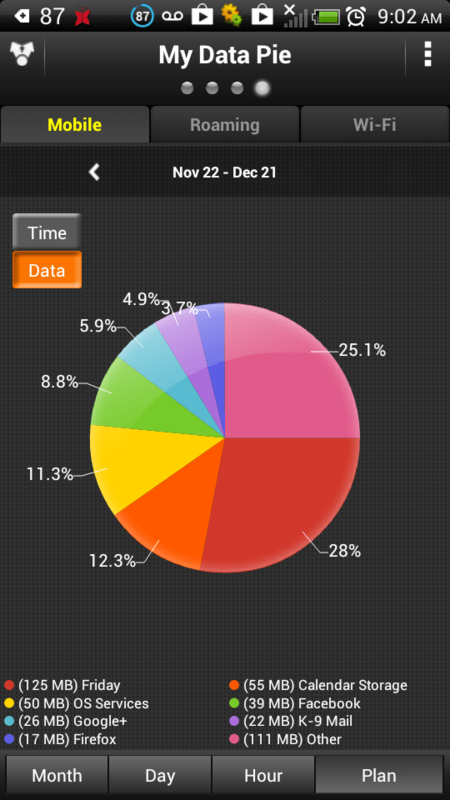 If you are looking for a way to track your data usage on an android phone then this is a mus have app.